In this blog post you'll find 10 accessible tips for your trip to Barcelona by wheelchair. Whether you're traveling for the first time to Barcelona or you are a regular visitor, there is always something new to discover. Barcelona is always fun, and Barcelona is for everybody. Discover the secrets of Catalan cuisine and follow a cooking workshop in Barcelona from the comfort of your wheelchair. A cooking class can be the highlight of your trip: an original experience that stays with you. Together with the chef you go shopping for the ingredients on the market. You start with tapas or gazpacho, then you make paella and you finish making a Catalan seasonal dessert. Afterwards you enjoy together as a group your delicious lunch. The building and the tables are 100% wheelchair accessible. You'll also get an email with the recipe and and ingredients. A perfect trick to impress friends and family at home and a great souvenir taking you back to the beautiful trip you've made. Please contact us for a wheelchair accessible cooking class. If you would like a little more explanation about the monuments and city's history, we can provide you with an English speaking guide. Just next to the El Borne district and close to the beach, you find the beautiful city park, Parc de la Ciutadella. Locals come here to celebrate birthday parties, come sunbathing, read a book, play music etc. A green hotspot, in the middle of the city. Barcelona's wheelchair friendly zoo is also near the park. No matter how you look at it, Antoni Gaudí is Barcelona's hero. There's no other city where you'll find as many creative buildings, originating from the Modernism (the Catalan version of Art Nouveau). Which one of Gaudí's monuments do you really have to go and see? Our tip: go visit the Sagrada Familia by wheelchair and really take your time for it. The other Modernist buildings of Gaudí and his colleagues are definitely worth seeing from the outside : Hospital de Sant Pau, Casa Vicens, La Pedrera, Casa Batllo, Palau de la Música and Palau Güell. The towers of the Sagrada are not adapted for disabled visitors in a wheelchair. Parc Güell is not easily accessible for visitors in a wheelchair. Therefore we don't recommend it. Please contact us for a guided and wheelchair accessible Gaudí tour, tickets for wheelchair users or a concert in the wonderful and accessible Palau de la Música (your companion has free entrance). Calçots in February. You eat these roasted onions on the barbecue, with a specific sauce. They are served as an appetizer and after you can enjoy a (rather extensive) meat plate. Churros: a delicious sweet snack! In each district of the city you will find churrerías. You dip them in warm chocolate sauce, with or without cream. A carajillo is a coffee with a shot of liquor in it, such as Baileys. On Sunday you drink a glass of sweet wine, Vermut, with a few olives as appetizer. The locals only start their lunch after 14h. The perfect neighborhood for the appetizer is Poble Sec where you can find dozens of cosy terraces in Carrer de Blai. Enjoy a sparkling glass of cava as appetizer or as dessert. Cava is produced in Catalonia and the Catalans mostly drink it on Sundays or public holidays. Admire the world's best football team by wheelchair and go see a football game of FC Barcelona. The club is loved by every Barcelonian. The stadium, Camp Nou, has an accessible area for disabled football fans in a wheelchair. As a companion of a disabled person, you are entitled to free entrance. In case you want to book an accessible ticket for FC Barça, please count on us for the reservation. Enjoy Barcelona's stunning skyline and have a drink or a cocktail on an accessible rooftop terrace. 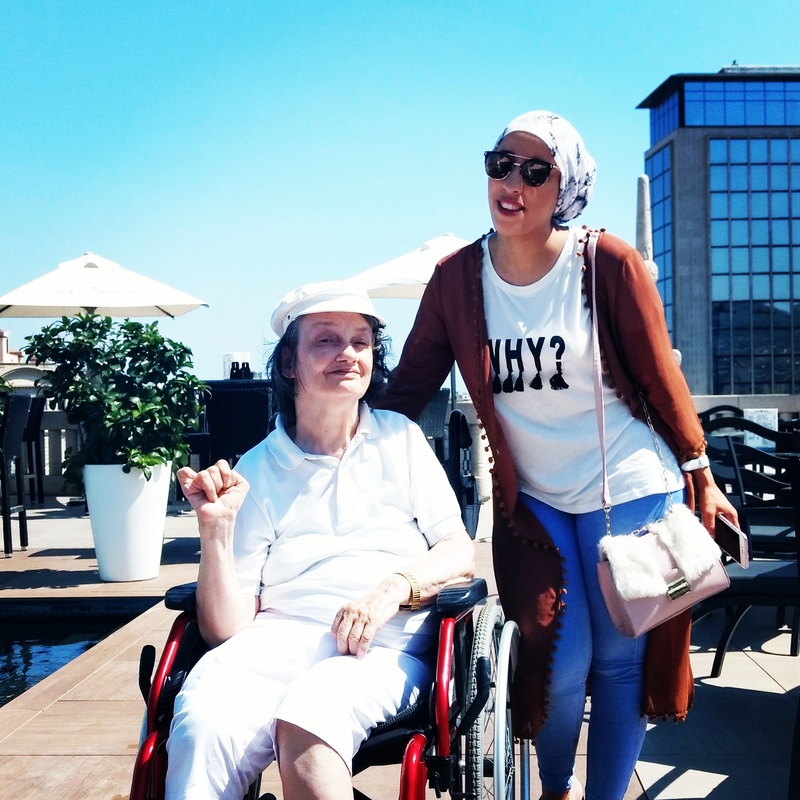 Barcelona has dozens of hotels with fantastic rooftop terraces, perfectly doable by wheelchair. During the warmer months of the year, you can come here as a regular customer, have something to drink and enjoy breathtaking views. A "cosmopolitan" experience that makes you instantly happy. Our favorite is Hotel Yurbban's classy rooftop terrace. Please send us a nice selfie once you are there ! La Boquería is Barcelona's famous and busiest indoor markets. Fortunately, there are dozens of other markets where you can stroll more quietly in your wheelchair. The accessible markets Mercado de Santa Caterina near the cathedral and the beautiful Mercado del Ninot in Sant Antoni are definitely worth visiting. Take your time to check out the local products, buy souvenirs at and listen to the loud saleswomen. Our favorite area of the year is El Raval. You'll find here an interesting mixture of nationalities, the oldest bars of Barcelona and at the same time more and more fashionable shops. Not so long ago El Raval was an unsafe neighborhood with lots of prostitution. But since a couple of years, the district has been upgraded and thoroughly polished. The modern art museum, the MACBA, is a hotspot and an architectural gem. Just in front of the museum you see dozens of skateboarders. You can spend hours here watching people. Take a stroll in the charming Carrer de Joaquín Costa and Carrer del Dr. Dou. Have a drink on the beautiful and lively Rambla de Raval. And last but not least, enjoy a delicious casual Mexican meal in Rosa del Raval. The restaurant is wheelchair accessible for customers and has a lift. It's also opened from 13 am to 00 pm, perfect for those who like eating early. For guided tours, transfers and customised activities> please talk to us!